Citizens around the world feel a little happier than they did a year ago. 68% said they were satisfied, two points more than at the end of 2015. A very large and significantly more consistent majority than in 2012, when the percentage was 53%. In Spain it also improves the perception of what happened 12 months ago (59% are happy today), but it is still far from the levels recorded in 2012, when the government of Mariano Rajoy applied the hardest cuts, which were started To feel in the months and years that follow. The data comes from the 40th End of Year global survey, powered by the world’s leading market research and polling association, the World Wide Market / Gallup International (WIN / GIA). 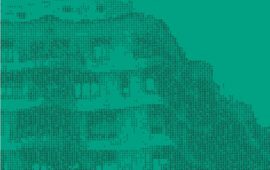 A study that gathers the opinions of citizens from 66 countries around the world (with more than 66,000 interviews), and whose fieldwork in Spain – 1,000 online surveys conducted between October 28 and November 6, 2016 – has run In charge of the DYM Institute, member and responsible in our country of WIN / GIA. 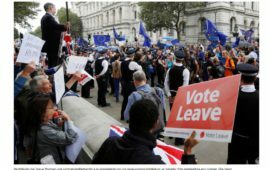 The survey addresses, in addition to more cyclical issues – such as the desire for permanence in the EU, greater after the referendum of Brexit in the United Kingdom – economic and personal expectations, as well as world happiness. Thus, in 2016, 68% of the respondents from around the world declared themselves satisfied with their lives, 66% felt that same a year ago. The percentage was 70% in 2014, 60% in 2013 and 53% in 2012. This year, 9% were confessed to be unhappy (it was 10% by the end of 2015) and another 22% said they felt neither happy nor unhappy . If you look at the numbers in Western Europe, it turns out that the volume of content with his life is 56% and that of unhappy, 11%. 12 months ago, the percentages were 52% and 12%. In 2012, it was 49% who declared themselves satisfied, and 13% the opposite. 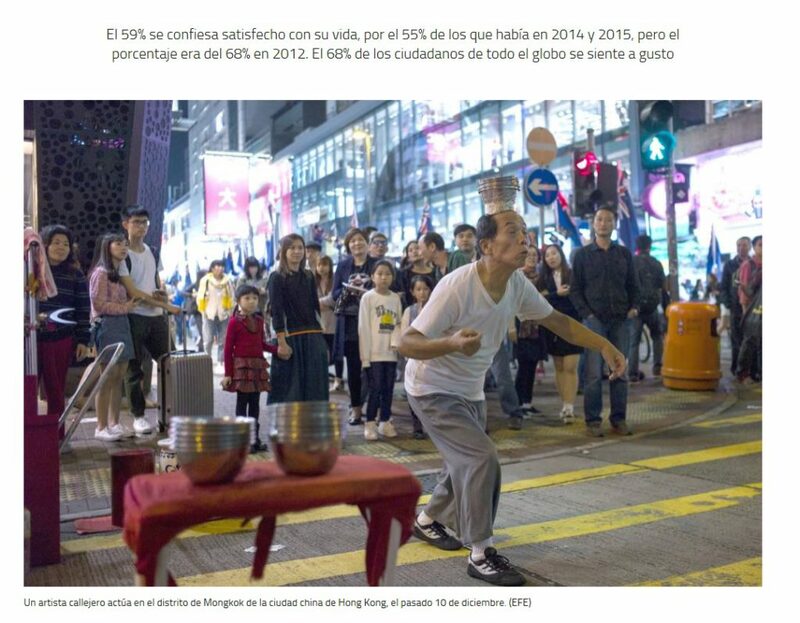 In Spain the perception of happiness has grown in the last year: 59% indicate that he is happy with his life (compared to 10% of unhappy people). In 2014 and 2015, those who confessed satisfied were less, 55%, and in 2013, one of the hardest years of the crisis, just when they felt the cuts applied by the Executive of Mariano Rajoy, still less, 52% . In 2012, the weight of the happy was greater, 68%, by 13% of those who thought they were unhappy. By geographical areas, the WIN / GIA study notes clear differences. Thus, the citizens of East Asia and Oceania are significantly happier (78% are so confessed) than those in the Middle East and North Africa (43%). 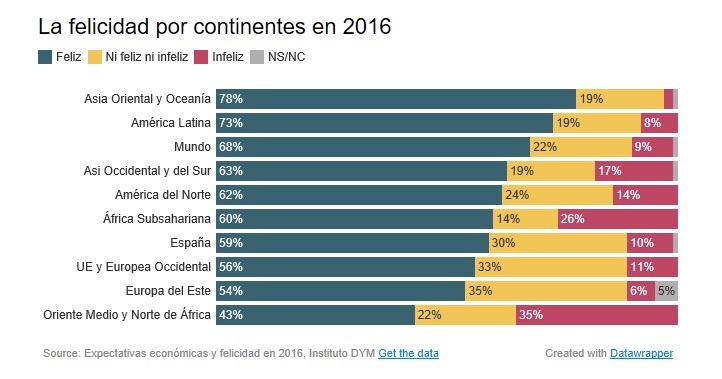 In the ‘Happiness Ranking’, Latin America (73%), West and South Asia (63%), North America (62%), Sub-Saharan Africa (60%), EU and Western Europe (56%) and Eastern Europe (54%). Fiji and China are, in fact, the happiest countries in the world: they register respectively + 89% and + 80% of net happiness (that is, the number of those who feel happy but those who confess they are dissatisfied) , Followed by the Philippines, Vietnam, Panama, Indonesia and Paraguay. The most unfortunate country in the world is Iraq, for the third consecutive year. His net happiness score is + 1%. That is, there are more who confess happy with their life for only a point. The breakdown by geographical area also confirms that, as in previous years, the most striking among Europeans is their greater skepticism about happiness, since 33% of the individuals in Western Europe and 35% of the citizens of the East are Located in the temperate zone, in the ‘neither happy nor unhappy’, a percentage that does not occur in other parts of the globe. 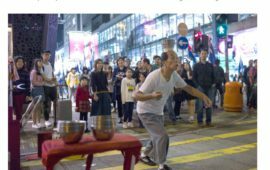 The citizens of East Asia and Oceania are significantly happier (78% are confessed) than those of the Middle East and North Africa (43%). In Spain, the happiness index (the net balance of those who think that their life is doing well except those who think it is doing poorly) is + 49%, better than in 2015 (+ 45%) and in 2014 (+ 47%), and considerably higher than in 2013 (+ 38%). But the Spanish, however, still do not recover the levels of happiness prior to this last year (+ 55% in 2012 and 2011). The survey shows, however, that this net balance is not exactly the same according to the different age, economic and labor conditions. Thus, the most satisfied are 26- to 35-year-olds (the index is + 58.7%), and the most unhappy are adults aged 36-45 (+ 37.9%) and 46-55 ( + 39.8%). By income, the happiness rate is very low among those with fewer resources (+ 11.8%). If you climb on the ladder, the percentage of satisfied progressively gains advantage. In this way, those with very high incomes are at a very high rate of + 92.6%. A logic that also works when you ask about the work situation. The net balance is higher (+ 65.8%) among those working full time, and is sunk among the unemployed (+ 19%). In the range between 44% and 49.7% are those who have a part-time job, retirees and students. In the housewives, the index is + 52.9%. In short, there is a clear correlation between the level of happiness declared and the income threshold and employment situation. The WIN / GIA survey also asks about expectations for 2017. 52% of citizens across the globe believe that the year will be better than 2016, similar to previous years (54% in 2015, 53% In 2014, 48% in 2013). In Western Europe, however, prospects are far more negative than global ones, although they have slightly improved. Thus, 29% of Europeans estimate that 2017 will be better, by 27% who thought the same 12 months back from 2016. In Spain, while, the trend is opposite. Less optimism is perceived: 39% think that 2017 will be a better year, when in the previous wave that percentage was 42%. Despite these data, the Spanish are still more optimistic than the average of the countries of Western Europe. We now turn to the general expectations index, which is the net balance of those who think that 2017 will be a better year less those who believe it will be worse than 2016. If this is a global scale of 37, for Spain it is less currently 17 Are more negative expectations than last year (28), although the number of optimists continues to outperform pessimists. The index in 2014 was 13, and in 2013, -4. Differences are observed according to sociodemographic variables. In this way, the younger generations are more optimistic, as are those with higher incomes. And if you take into account the work situation, it is perceived that those who have better expectations are the students and those who work full time. The last section of the study is dedicated to the evolution of economic expectations. 42% of citizens around the world predict that 2017 will be a year of prosperity, compared to 45% that registered 12 months earlier. That is, optimism has declined despite the fact that much of the globe remains out of recession. But that 42% is almost double (22%) of those who are pessimistic. In Western Europe the numbers are significantly lower: only 15% think that 2017 will go better in the economic, by 42% who think that it will get worse. A year ago, those who anticipated that 2016 would be a round financial exercise was 14%. 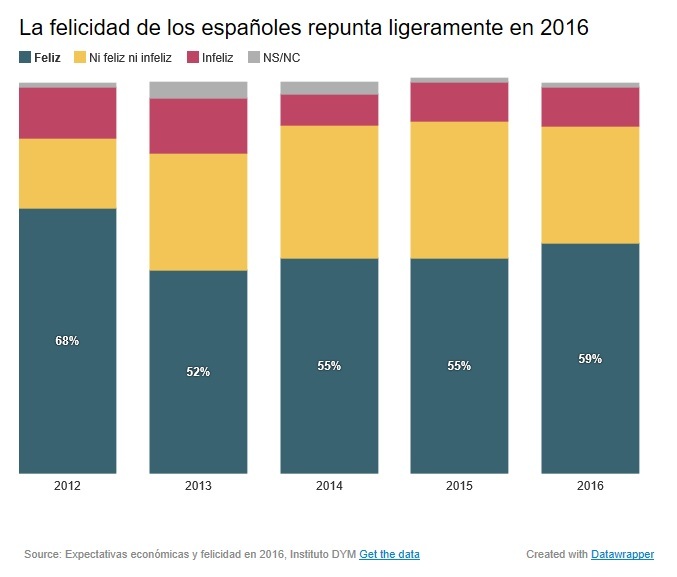 In Spain the movement is the reverse: now 27% predict that 2017 will be prosperous, when 12 months earlier the percentage was somewhat higher (28%). However, our country is still clearly above the average of Western Europe. The index of economic hope is the net balance of those who believe that 2017 will be a year of prosperity except those who think it will be difficult. That rate has been negative for years, but in this latest wave has broken the trend of continuous improvement of economic expectations that has been producing since 2012 in Spain. The latest index is -10, compared to -1 in the previous year or -17 in 2014 and -40 in 2013. The most optimistic groups with regard to the economic situation for 2017 in Spain are individuals between 26 and 35 years of age, they now have middle-high and high incomes and those who have a full-time job.